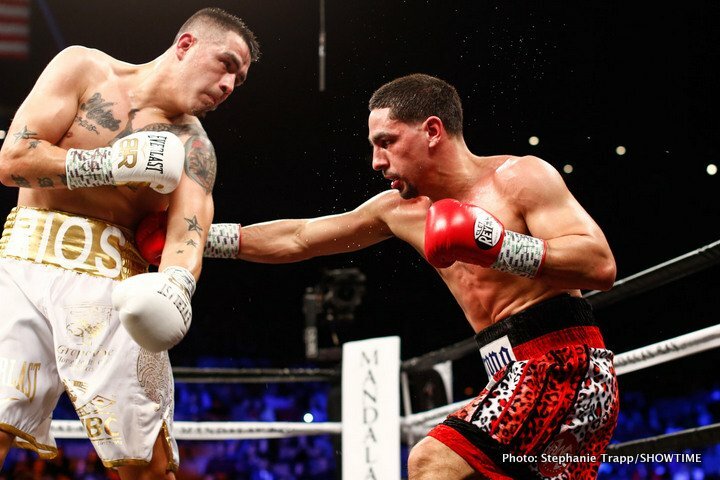 By Dan Ambrose: The ratings for last Saturday’s welterweight contest between Danny Garcia (34-1, 20 KOs) and Brandon ‘Bam Bam’ Rios (34-4-1, 25 KOs) were arguably poor for Showtime Boxing. The Garcia-Rios fight averaged 516,000 viewers with a peak of 558,000. The card itself averaged 412,000 viewers. It’s not surprising that so few boxing fans tuned in to watch the Garcia vs. Rios fight, because it was a terrible mismatch on paper, and even more so in reality. Rios looked like a textbook version of a completely shot fighter with him plodding around for 9 rounds, eating punches and throwing weak shots back. Coming off of an 11-month layoff following his 12 round split decision loss to WBA 147 lb. champion Keith ‘One Time’ Thurman in March 2017, Garcia knocked Rios out with a right hand in the 9th. Garcia probably could have knocked Rios out much earlier in the fight if he’d stayed still not used to much movement. The 29-year-old Garcia was running from the 31-year-old Rios as if he was an enormous power puncher rather than a former lightweight that had eaten himself out of the division. Rios didn’t look like he belonged inside the ring with Garcia. That much was apparent. This fight would have been an awful one to make even when Rios was in his prime back in 2011, but for it to be made in 2018, it was bad for the boxing fans and bad for Rios. The co-feature bout between WBC super middleweight David Benavidez (20-0, 17 KOs) and Ronald Gavril (18-3, 14 KOs) averaged 458,000 viewers with a peak of 489,000. This was a mismatch too. Benavidez pounded out a one-sided 12 round unanimous decision by the scores 120-108, 119-109 and 120-108. Gavril, 31, was taking bad punishment for the entire fight. This one could have been stopped due to the one-sided nature of it. Gavril’s corner let him stay out there, and it was an awful fight to watch if you’re into watching competitive fights. If you like watching mismatch, this was the fight for you. It’s surprising that Showtime agreed to televise this rematch because it was always going to be a mismatch. In the first fight of the televised card on Showtime, light welterweight Yordenis Ugas defeated Ray Robinson by a 7th round knockout. Ugas vs. Robinson averaged 314,000 viewers with a peak of 487,000. This was not a great fight either. Former WBC welterweight champion Victor Ortiz and Devon Alexander averaged much more respectable 1.1 million viewers on the non-premium channel Fox last Saturday night. Ortiz and Alexander fought to a 12 round draw. The two fighters took turns looking good in one half of the fights. Alexander looked impressive in the first half of the fight, whereas Ortiz was the one that took over and finished strong in the second half. Last Friday, Ray Beltran defeated Paulus Moses by a 12 round decision to win the vacant WBO lightweight title on ESPN. The Beltran-Moses fight averaged 703,000 viewers. Those are not great numbers for a fight on free television on ESPN, but it’s not surprising because those are not well-known fighters with the casual boxing fans. This was a Top Rank promoted card. Putting Beltran against Moses in a main event was always going to be a fight that would struggle in bringing in viewers. Top Rank should have put the Beltran-Moses card one of the Manny Pacquiao cards, because he’s not popular enough to headline his own card. Beltran, 37, has been fighting for 19 years as a pro, but he’s not been able to put together a large fan base.